Aritzia is a women’s fashion boutique that began in Vancouver, British Columbia and has locations in select cities across North America, including New York and San Francisco. Aimed at women ages 14-30, Artizia offers a variety of options for clothing and accessories. With Big Apple Buddy’s personal shopping service, you can now buy direct from the Artizia online store anytime, anywhere. With clothing options that vary from casual to more formal wear, Aritzia offers something for everyone and for every occasion. The Aritzia Babaton Prosper Dress is made from a smooth stretch fabric that conforms to the body and keeps its shape after each wear. 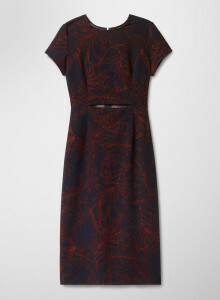 This dress comes in a subtle but striking red and navy pattern and has a small keyhole detail at the waist. Dress it up or dress it down: this piece works for both casual and formal occasions. Artizia also offers a variety of fashion accessories, including bags, jewelry, hats, and scarves. 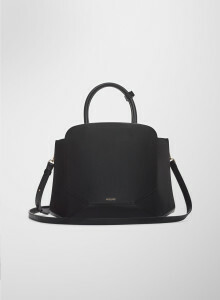 The Aritzia Auxiliary Bega Satchel Bag is the perfect on-the-go bag to bring with you everyday. Crafted from smooth and rich premium leather, this bag comes with an optional shoulder strap to enhance versatility. It comes in a black or a wine red color, so choose which one suits you best! Unfortunately, the USA Aritzia online store does not currently offer international shipping. However, Big Apple Buddy, your personal shopper, can help you buy products direct from the official USA Aritzia online store and ship them to your doorstep, no matter where you are in the world. If you would like to buy from the USA Aritzia online store, simply let us know which items you would like to order (by filling out the form below) and we’ll get back to you with a free international shipping quote within 24 hours.